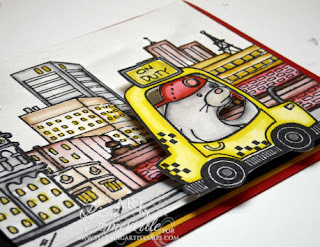 Wanting to do something a little different with the new DoodleFactory Backdrops, I decided to make a Ribbon Slider Card, so that when the ribbon is pulled, you'll see the Taxi move across the DoodleFactory Rooftop Backdrop. I stamped my Rooftop image in Black Archival, then colored using the Marker Water Coloring Technique, then added some Spica Glitter where I wanted some shimmer. I cut a slit near the bottom of my stamped panel, this is where the Taxi will ride. The Taxi was stamped then masked (also removing the window opening) with Eclipse Tape, so I could stamp Guaco so it looks like he's driving the Taxi. Both images were colored using the Marker Water Coloring Technique. I made a tab, then slipped it through the slot and adhered to the back of the taxi, then adhered the backside to my ribbon. To stamped panel is placed on dimensionals, so that it's easier to pull the ribbon back and forth. ETA - a reader left me a comment that Dawn had created a slider card using these same images, which I hadn't seen posted. You can see Dawn's cute slider card here. I love the idea of a slider!!! Cute. 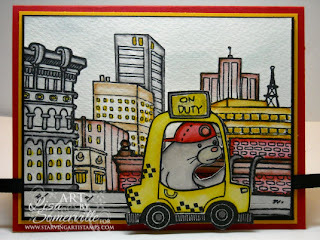 This looks almost like Dawn Barrett's card on the Starving Artistamps website. Guaco the cab-o driver! tee hee...another keeper Lisa, this is hilarious! heeheehee! THis is super FUN!!! beautifully colored. Wow..thanks for posting credit to me. It is a fun card to make!